Note: We do not handle timeshare reservations. The natural beauty and charisma of Los Cabos meets luxury accommodations and world-class amenities at this fine beachfront resort. You’ll find plenty of ways to enjoy yourself here, from the sparkling beachfront pools and whale slide to the European-style spa and fitness club. Villa del Palmar is full service and more: there’s a full spa, fitness clubs, two restaurants, art galleries and jewelry shops, a pharmacy, and a market! There’s so much to see and do that you might not even leave the resort. New reservations: 1-888-317-2226 Note: We do not handle timeshare bookings. 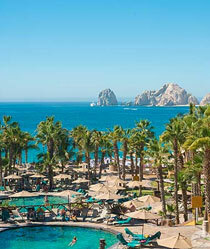 All Rights Reserved ©1994 - Present • VillaDelPalmar-Cabo.com is a partner site of Villa del Palmar Beach Resort & Spa Cabo San Lucas.